Why Do Your Hands Swell When Hiking? Hike in the New Year! Do You Need Trekking Poles for Hiking? Hiking! It’s a Great Excuse! From Phoenix, take the I-10 to AZ-143N (towards Sky Harbor). Stay in left lane to turn left onto E McDowell Rd. Take this down for about .4 mile then turn right onto N 44th St. Stay in the right lane, which will turn into E McDonald Dr in about 4.5 miles. At the traffic circle take the 2nd exit then turn left into the parking lot. 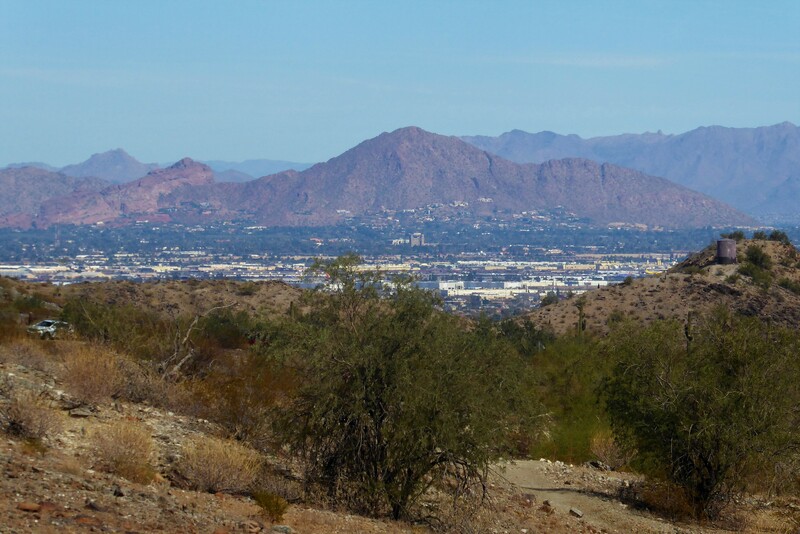 Camelback Mountain is an iconic landscape located Scottsdale, Arizona which is near the Phoenix area. From a distance, the mountain range looks like a camel laying down (hence the name Camelback). 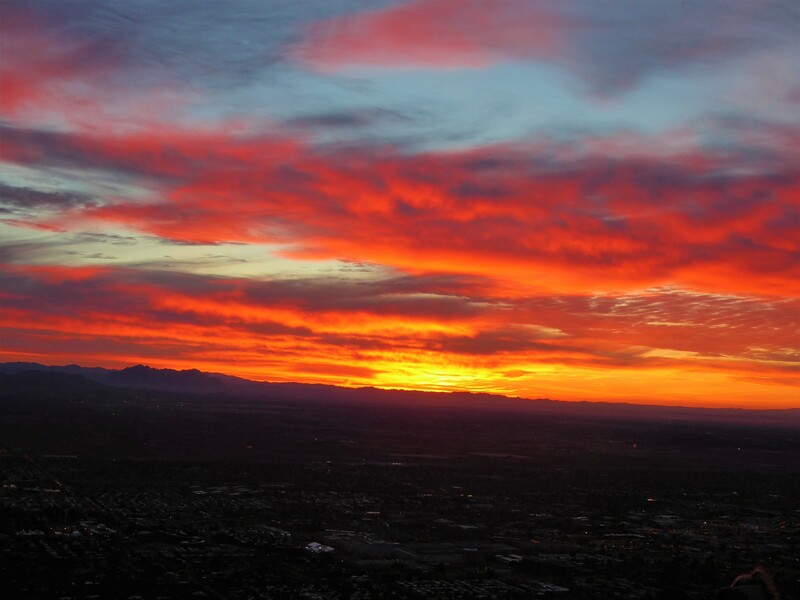 This makes the mountain easily recognizable when gazing upon the surrounding mountains in Phoenix. 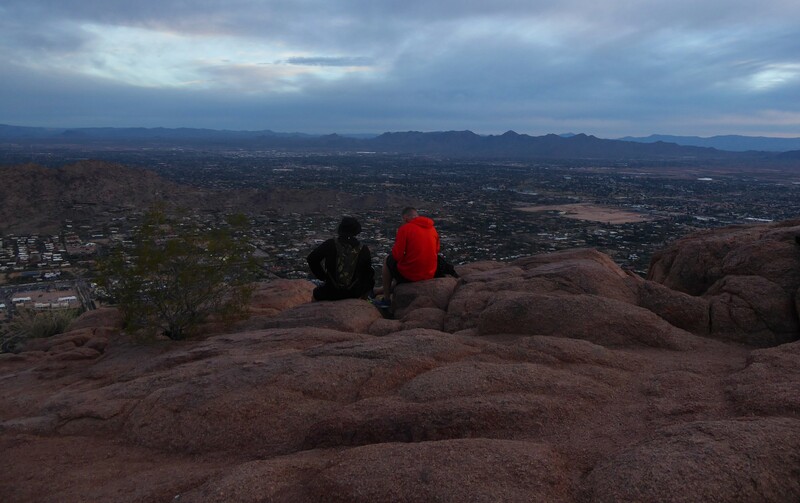 Echo Canyon Trail on Camelback Mountain is one of the two trails that will lead you right up to the summit, which also happens to be the tallest peak in the Phoenix area. While standing on top of this epic summit there are amazing view of the city below and the surrounding mountains. It is a trail that you will never forget but it also demands respect. 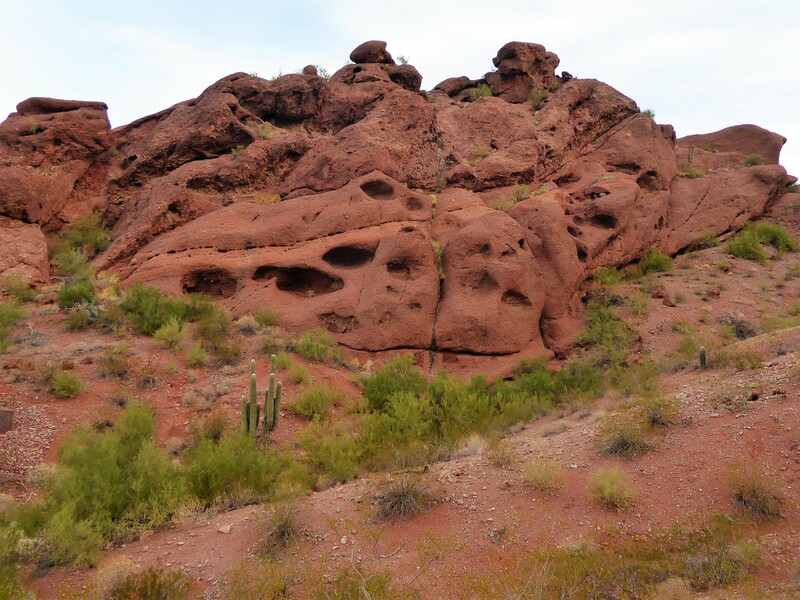 Echo Canyon Trail is one of the most popular hiking trails which unfortunately has also resulted in being the deadliest mountain. 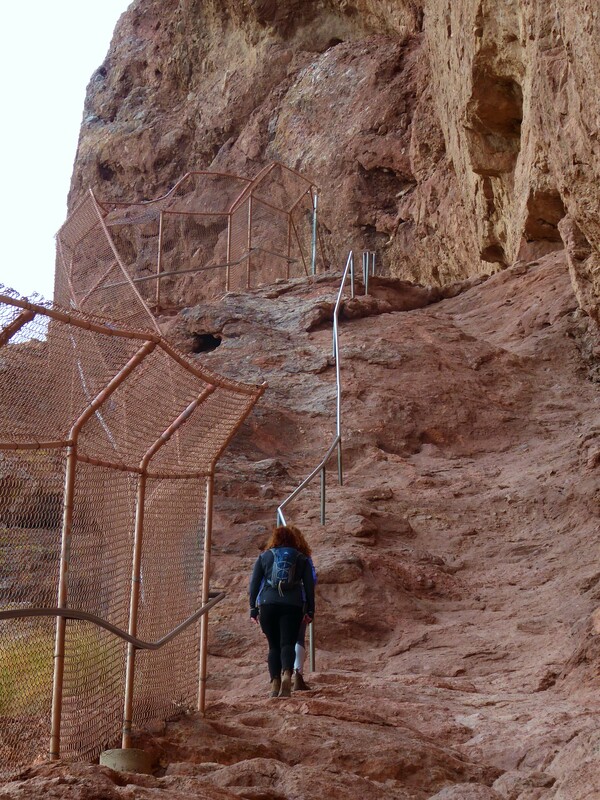 Echo Canyon Trail is an expert level hike. Although warnings are posted at the trailhead, you will still see unexperienced hikers who have not yet learned their limits trying to push themselves to the summit. This results in a lot of hiking accidents, dehydration, search and rescue crews and unfortunately deaths. So, with that said, be careful on this trail especially if you are not used to desert hiking and make sure you are fully prepared with water on this hike. Echo Canyon begins as a wide dirt path with a quick incline up and a few switchbacks that get your heart racing. This beginning portion of the mountain looks as if you are in an ocean aquarium. The surrounding mountains are porous like a sponge and has bright green moss growing over it, making it look as if it’s algae. There are a few lookouts where you can pull over to take a break or enjoy the view. 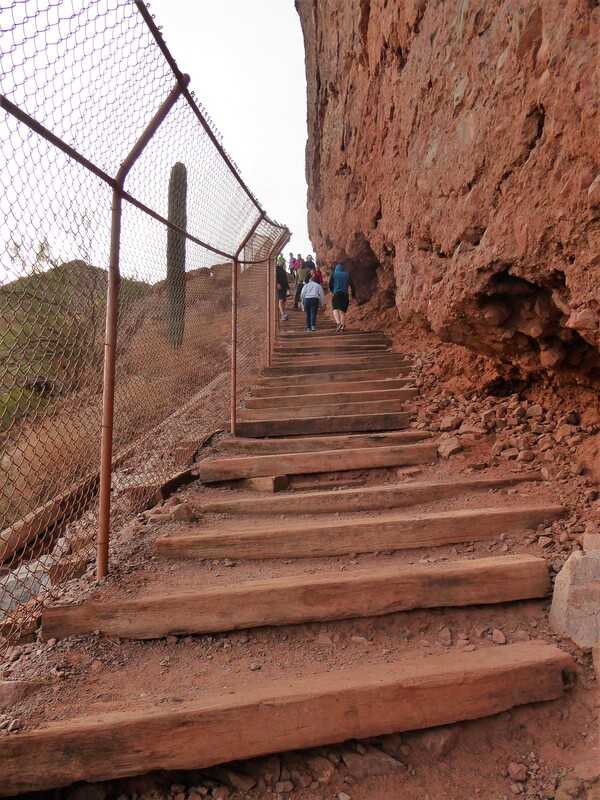 At around 0.4 mile the trail picks up with a set of wooden stairs. Soon after this, the route becomes so steep that there are metal railings anchored into the mountain to safely assist hikers in this dicey situation. At first, a metal pole will only on your left-hand side but soon after there will be a pole in the middle and then to the right. From my experience, the pole on your left (as you are going up) is the best pole to hang onto. There are carved out foot notches’ in the rock that guides your feet up. The other poles will not have these little notches, so it feels a little uncertain to walk on since it’s so steep and smooth you can easily slide on it, even with good gripping shoes. Once at the top of this steep section, you may think the tough part is over, but it has just begun! 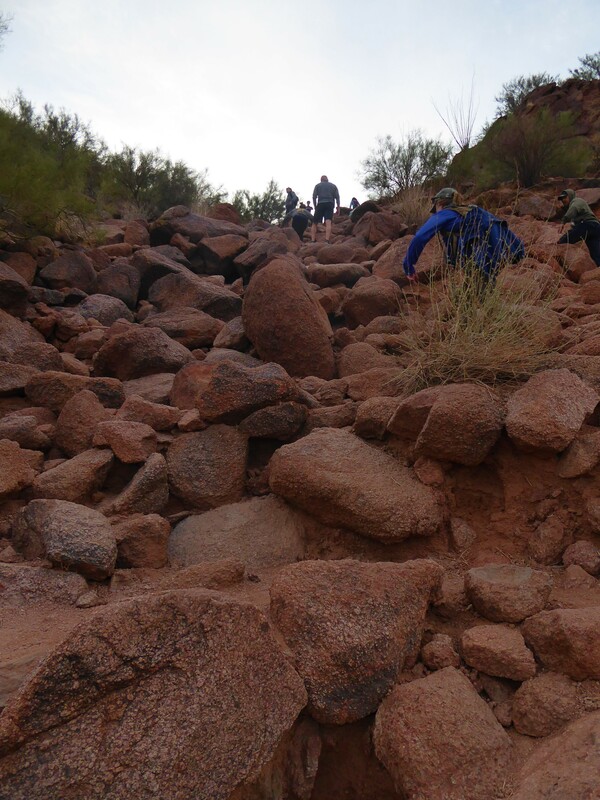 The trail now will require scrambling, pretty much up all the way to the top. For this reason, it may be a good idea to bring gloves, although it isn’t completely necessary. 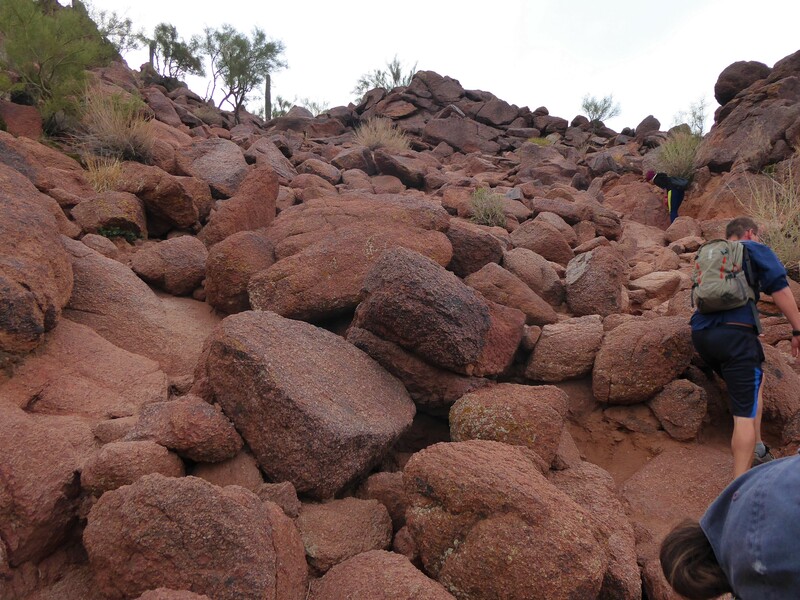 There are steep piles of bigger rocks that you will need to hike up. At times, it feels as if you’re back in that aquarium climbing up big pieces of gravel to get the relief of freedom up at the top. On a few occasions the trail will flatten out, but only brief moments until you are greeted by another big pile of rocks that requires scrambling. 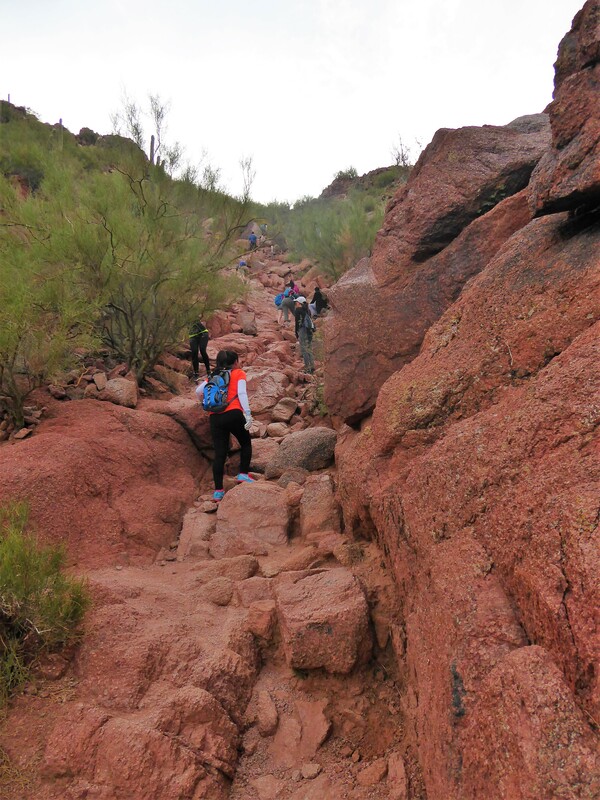 Echo Canyon Trail challenges your sense of resourcefulness. While there are trail markers, which point you in what direction you need to head up, it’s still a scramble and therefore it’s up to you to figure out which direction up is best and safest for you. At 0.7 mile it may look like the trail veers to the right, but you actually want to stay in the middle section and walk up the smooth inclined rock. If you go to the right, it gets you off trail and towards the edge of the mountain which will require you to either back track, or make some dangerous maneuvers to climb back up onto the trail. 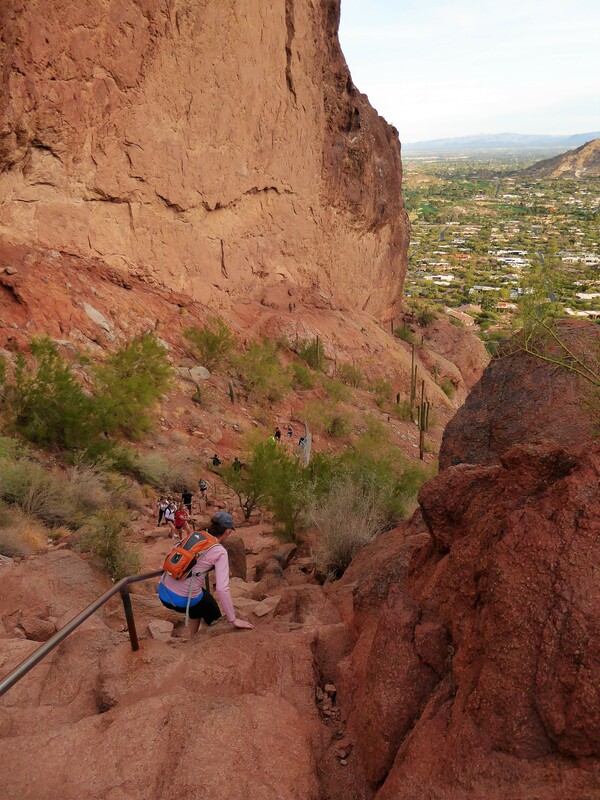 At around 1.1 mile you will be making your last ascent up to the very top of Camelback Mountain. A feeling of freedom and space will encompass you as are surrounded by a 360-degree view of the entire city and the neighboring rolling mountains. Relax and take your time up at the top to enjoy the view you have worked so hard to see! The parking lot fills up quickly, the area around the trailhead doesn’t allow for many parking options (besides in the trails parking lot). You may need to wait for a spot to open or you can always park in a nearby business parking lot and either Uber/Lyft to the trailhead or bring a bike. In the beginning this trail is very well marked, clear and easy to follow. In sections where scrambling is required, the trail signs still appear but there is no direct path laid out. 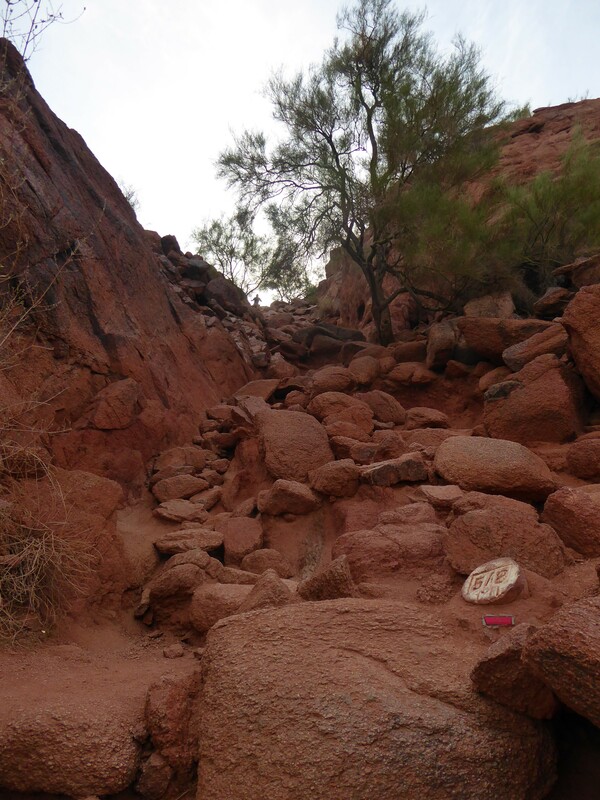 It’s up to the hikers’ discretion to choose scrambling path. No better way to start the day than with puppy kisses and hiking, right?! Thanks for sharing @amineral 💕 #repost #hikephoenix ⠀ ...⠀ "Lots of hiking this weekend! This was hike 1/2 on Saturday and my furbaby did great. My friend is great at capturing jake giving me kisses since it rarely happens. Its mostly when he's out having fun 🐶❤ 📸 @bruticorn"
Look at what @dawnbsellsaz is selling today! The Wind Cave Trail 😍 Who else has hiked this trail? #repost #hikephoenix⠀ ...⠀ "Great Trail. I’d rate it somewhat moderate but definitely manageable for hikers of any level. 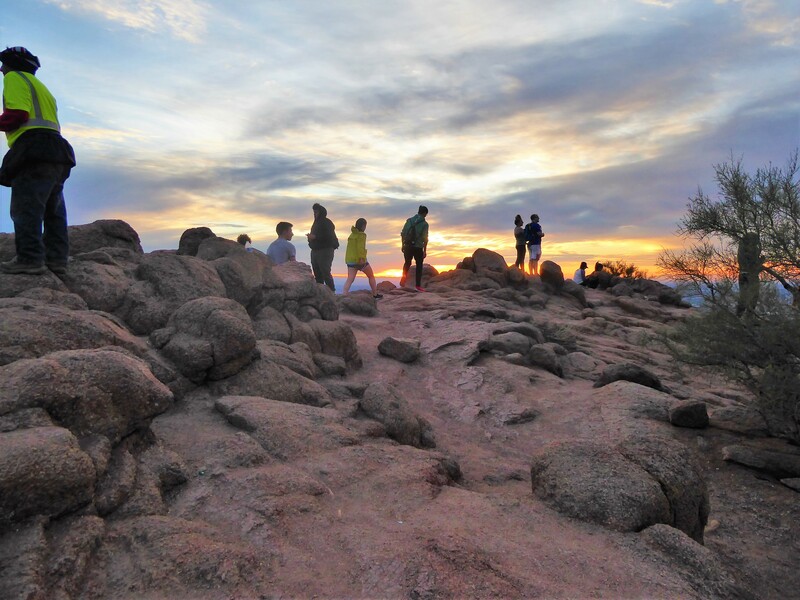 “Living It, Selling It”⠀ ..⠀ ..⠀ ..⠀ ⠀ .. ..⠀ .. #arizona #arizonalife #arizonaliving #azlife #azliving #dawnbsellsaz #livingit #sellingit #lovingit #livingitsellingit #arizonabydawn #hikeaz #hiking #azhiking #arizonahiking #arizonahike #userymountain #windcave #arizona_hiking"